WOW!!! All I can say about this hike is solitude…If you are looking for hike where after being on the trail for less than a mile you pretty much don’t see or hear any signs of civilization, then this is your hike. Of course this is just another quality hike that I got from Don Weise’s book, Circuit Hikes in Harriman-35 Loop Hikes and Trail Runs in Harriman and Bear Mountain State Parks. (I completed this hike on 7/13/16). If you look at this hike on the map, it resembles a melting lollipop! Starting off at the end of Johnsontown Road (which is a circle), the beginning of the trail is clearly marked with horizontal white bars. The beginning of the trail immediately starts heading uphill, although slightly and for a short period is, at first, a mixture of dirt and road. As you move deeper into the woods and away from everything, the trail goes through many variations and runs the gamut from dirt to rocks to a fine grassy surface. A pleasant surprise that I had on the trail today was the wildlife that I encountered. Usually I don’t get to close to many animals, but today, I could have reached down and touched the rabbit that you see in this picture. It was truly amazing! I am not going to lie, I love rabbits! The trail, meandering its way through the woods, continues to move uphill ever so slightly and at times you don’t even notice that you have been gaining any elevation until you turn around and look at where you have been. Although you do spend time on trails at the start, you also find yourself traversing a woods road that is easy to walk on. As I have noted on other hikes, this is also one in which you could introduce small children to the joys of hiking. One and a half miles into your trip you will pass the Dutch Doctor Trail on your right. You will also encounter this shelter again on the return trip, this time on your left side. One of the other scenic wonders that are in abundance in this area are the isolated and stray boulders that just appear to be cast throughout the park. These boulders seem to have just been placed where they are by some unseen force. Continue to follow the white bar trail for 1.75 miles where you will see the start of the yellow triangle trail. This, and the victory trail (later) will signify the head of the lollipop. Stay to your right and now follow the yellow triangle trail. One of the more unique things that I did notice after I moved on to the yellow triangle trail was the almost immediate change in the terrain of the trail. The triangle trail represented a calmer, more meditative and deliberative approach to this hike. Notice how the lush woods seem to envelop you as you become one with the terrain. It is more earthen and the sound of your boots striding along the trail signifies the solitude that I was seeking. At almost three miles, you will be able to see Lake Sebago on your right. I decided at this point to stop for a water and picture break. 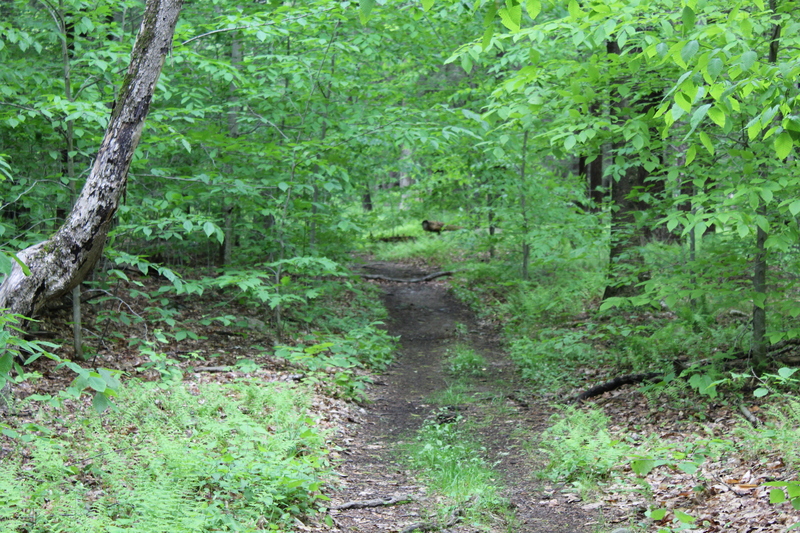 The trail becomes a little tricky at this point as you should continue on to the right along the shores of Lake Sebago. The markings aren’t that clear, but even if you follow what looks like what should be the obvious trail, you will end up back on the yellow trail triangle trail shortly. Staying on this trail, you will eventually come to the shores of Lake Skenonto. After you spend some time at Lake Skenonto, a short walk will bring you to the Blue “V” (victory) trail (this is a woods road for the time you will be on it). As it was another incredibly humid morning, it was a great relief to find that when I turned onto this trail, a strong breeze began to blow. Luckily and thankfully, this breeze stayed with me for the rest of the hike. After walking on this road for almost a half of a mile, you will see the familiar markings of the horizontal white bars that you had left to go on the yellow trail. Turn left here and you will now stay on this trail for the remaining three miles of your hike. Please note that once you turn back onto the white bar trail, it begins a nice uphill climb that will get you breathing pretty hard! As you move up the hill, feel free to periodically look to your right to enjoy the views. After you crest the hill, you will start a descent that takes you to the end of your hike. As I noted at the start of this post, this is an excellent hike if you are looking to get away from everything for a few hours and still get a good workout. During this hike I heard nothing but birds singing, chipmunks and squirrels running through the woods and the distant sound of freight trains. The breeze, which I gladly welcomed on the latter part of the hike, provided its own mystical soundtrack as I moved through the woods. There were no car horns, trucks, anything that resembled the civilized world. To say that it was bliss would be an understatement. That is why I dub thee…solitude. This entry was posted in Uncategorized and tagged Blog, Blogging, Calm, Circuit Hikes in Harriman, Don Weise, Hiking, Hudson Valley Hikes, Hudson Valley Hiking, Lake Sebago, Lake Skenonto, meditation, Mental Well Being, Solitude, Upper Hudson Valley, White Horizontal Bar Trail, Yellow Triangle Trail on July 16, 2016 by The Zen Hiker.